It is exactly 4:27 a.m. as I sit here and write. Some might say it is early, others late… For me it is simply now and because my brain is restless, my options after loading the washing machine are to read, write or cook. I completed a book about 4 o’clock in the morning the night before and have spent the day thinking about its contents in a poetic realm. If I cook, I eat and worry if the smell of food permeating the house will wake my man-child… He needs his sleep as an increase in seizures this week overwhelmed both he and his mother. (Yes, and I need the rest.) This leaves me to share with you a fun, relaxing day in my tiny kitchen and in the spirit of tradition. Tuesday, March 17 is St. Patrick’s Day. Yesterday, I noticed “No Parking” signs lining the streets and thought perhaps there is an upcoming marathon event. Snow had not completely melted away and I am thinking, it is early for such events. However, by evening whilst listening to the local news broadcast, I realize there is a St. Paddy’s Day parade and in even in our small town, it is a major event. (Having participated in a parade event, I can imagine right about now parade participants are beginning to stir in preparation…) Nonetheless, in 1762, America’s Irish immigrants held the first ever St. Patrick’s Day Parade and to no surprise, in New York City… 253 years ago… an enduring tradition. The beauty of this celebration is a testament to the benefits of embracing societal diversity. During the mid 1700s, many European immigrants entered the United States and the Irish, Italians and Jewish people were most “unwelcome.” Pork was ubiquitous throughout Ireland for making pork stews, soups, etc., and this was not the case in their new home as well the cost, was prohibitive. Eating from Jewish Street Carts and in delis, the cured beef was a similar product to Irish bacon. Consequently, the Irish began substituting corned beef for pork. 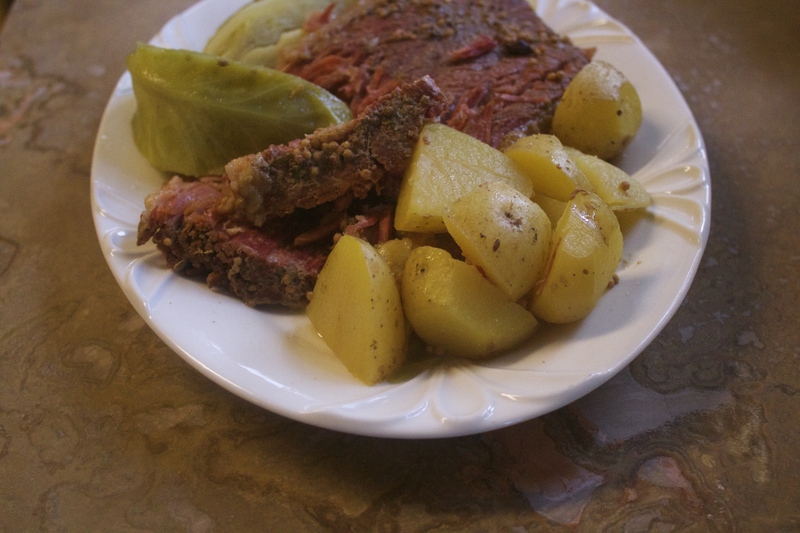 Thus corned beef and cabbage with potatoes became an American tradition. Tradition happened in my kitchen from early morning on as I pulled out the large Dutch oven pot. 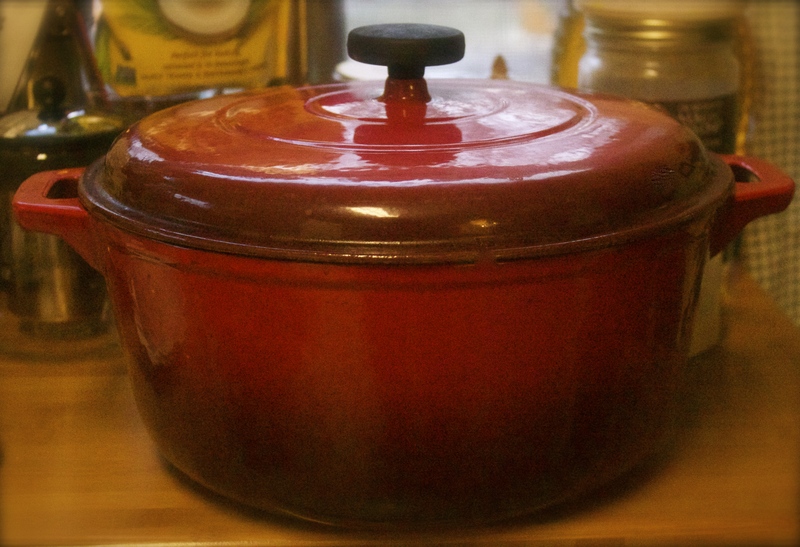 It is a thing of beauty… dark red, and heavy… stored at the very rear of the bottom shelf on the butcher-block table. This weighty pot is the perfect vehicle though for braising meats, making soups and stews and well worth the effort required for its use, including cleaning and putting it away. Today and into this weekend, leading up to Tuesday, March 17th it is a celebration of tradition. 1a : an inherited, established, or customary pattern of thought, action, or behavior (as a religious practice or a social custom) b : a belief or story or a body of beliefs or stories relating to the past that are commonly accepted as historical though not verifiable. A celebration of tradition… certainly not a religious practice because this is a weekend marked with a “whole lot of” drinking and reveling and speaks well of the cultural continuity established not simply by attitudes or customs but the institutions marking the making of good Irish whiskey. As well, rivers will turn green and long before your first drink. 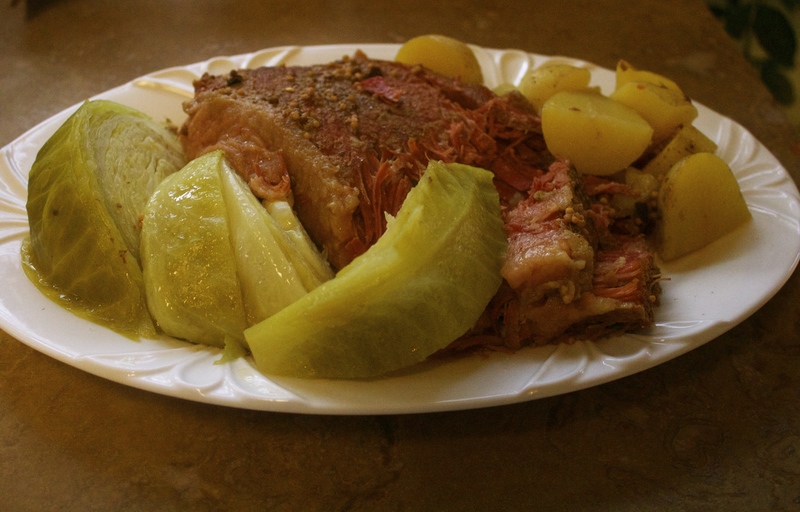 Growing up celebrating this “holiday,” the tradition of corned beef and cabbage first entered our home. Consequently, in the spirit of tradition, we got an early start to the celebration. It was a lovely spring day; warm enough to open doors and windows allowing the spring air to move the delicious smell of corned beef through the neighborhood. Having once lived in Chicago and joining in the many celebrations at local pubs steeped rich in tradition, I enjoyed some memories of old friends and fun times whilst standing in my TINYKITCHEN smelling what will surely produce GREATTASTE throughout the weekend while filling any BIGHEART with the intimacy of traditions and wonderful memories. In closing, I am thinking traditions are good. Sharing traditions open our lives to a world far greater than what the eye can see. We have Passover, Easter, Cinco De Mayo and Memorial Days coming at us soon… and food ultimately connects us… one and all.